The reporter’s question makes me stiffen. Was it goodbye? Stay frosty? Watch your six? Even though she can’t see the gesture on the other end of the phone, I shake my head back and forth and reply hesitantly, my mind gnawing at where the conversation is about to head. I hear scribbling as I wade through the silence, lost in thought before she speaks again. There’s an ugly fresco painting sitting in a room at my parent’s house. I see it every year when I visit, and it always makes me smile. It’s the last thing Kyle gave my mom before he died. Technically, he mooned her first and then presented the atrocious depiction of the Panama coast. When my mom asked what the hell she should do with the monstrosity, he informed her she must keep it forever and display the fresco with pride. Now it’s a ghost that haunts our memories. Sometimes we stare at it together. Neither of us can talk about Kyle for more than a few heartbeats before one of us feels the old wound tear anew. Years later, my mom’s friends will ask what the loss was like. “Like losing one of my own children,” she’ll say. Like me, she has never recovered from Kyle’s death. I think most veterans who lose a friend in combat carry a memory that rummages around in their mind like a raccoon digging through a dumpster. Sometimes you catch glimpses of it, but when you shine a light on the memory too long, it’s paralyzing. “Sergeant Sledge? Are you still there?” the voice on the other end of the phone asks. Kyle (far left) and me (center). Kyle’s team was a replacement after I was wounded in action. Every day, he woke up and told himself, “Rest in peace. Now get up and go to war.” And then, after a few years of pretending he was dead, he made it out alive. That’s the trick of it, I think. Six years before The Walking Dead aired, a reporter was the first to hear my final words to my best friend. Looking at the words now, I feel like Rick Grimes sitting in a barn at the end of the world, trying to process the past 13 years since Kyle’s passing. “Sorry,” I exhale, moving my eyes away from the fresco. And then I spill my last words to Kyle, which now feel empty. Words I wish I had replaced with a hug. In the middle of a hipster coffee shop near downtown Austin, Drew parts his lips and packs the bottom one with a pinch of mint Skoal. The habit is a familiar one — it’s an old Special Forces trick that prevents dysentery (the carcinogens in tobacco help kill bacteria). In my case, lining my jaw helped me digest the local food, but it also became a reliable source of stress relief, a salve for my nerves. Most of us pick up chewing tobacco or smoking while we’re in the military. Andrew “Drew” Davis is now 30 and a freshman at the University of Texas. Sitting in a class full of 18-year-olds has been an adjustment, considering he was an infantry sniper for seven years. When I asked how Memorial Day now affects him, I see the same pained expression we all have when we dig at the roots of our friend’s memories. My grandfather dealt with combat loss too, but I never knew the extent of it until after he passed. He was a paratrooper in World War II. 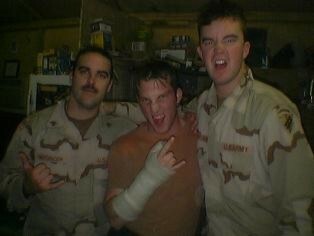 We talked a little about our experiences in war after I returned home from my first tour of duty. Before his death, he wrote out his life story and included tales I was unaware of. Almost a full decade after his death, my grandmother had his memoir bound and gave copies to our family. Within the first 20 pages, I learned the full extent of how deeply his friend’s loss bore down on him. War made him question God. Death made him angry. Grief and depression over losing his friends painted a man haunted in the margins. His memoir was like looking into the mirror and seeing the same words etched across the soul. That he wrote his grief down, some 60 years after the end of the war, showed me how much the loss still affected him. Looking at Drew’s face, I can see the gamut of emotions my grandfather wrote about. Later in the week, I will hear it in the voice of Chaplain Matt Williams. Matt’s Southern drawl, I imagine, was once filled with laughter and amusement. Today his voice is solemn. A medically retired chaplain, he now plays in a rock-and-roll band to remember the fallen and battle his own demons. I want to believe I’m not a dirtbag sometimes. Kyle asked me to look out for his dad before he died. I would visit from time to time, but it was so painful for both his father and me that I stopped going. Drew shared similar sentiments. He hasn’t spoken with the Fastuca family either. I wonder if the chaplain will be the one person who’s different. Matt’s comment has me curious. President Trump ruffled feathers among the military and veteran communities when he blamed his top generals for losing a Navy SEAL during a raid shortly after taking office. From George Washington to President Obama, many presidents have felt the full weight of their decisions to send men to their deaths as the commander in chief. The Washington Times reported that President George W. Bush wrote more than 4,000 personalized letters to the families of troops who died in Afghanistan and Iraq under his presidency. So how do veterans feel when their commander in chief blames their fellow service members for their friend’s loss? In addition to interviewing fellow veterans, I reached out to some friends with military backgrounds now serving in intelligence circles to unpack the sentiment regarding Trump’s administration. What I discovered was far different from the division and vitriol we see rampant within the media and our social networks. Most veterans I spoke with didn’t vote for Trump. But they didn’t vote for Hillary, either. Some refrained from voting entirely, while many voted third party. The consensus across the board, however, was the same. “Obama? Trump? Bernie? Doesn’t matter. Soldiers are gonna die. Everyone likes to assign responsibility to a political candidate, but it doesn’t change the world and the fact these politicians are elected officials representing the supposed interests of the United States,” one told me. While many were disheartened by the president’s response, they emphasized they didn’t want to get caught up in the politics behind it, because politics only continues to take away from the men and women dying in foreign lands. (This sentiment extends beyond the military community — many scientists are currently debating the effects of politicizing their work. Some believe it’s time to take a stand; others argue that making issues purely political divides rather than unifies and misses the larger point.) At least five of the men I spoke with pointed out that the position of commander in chief is often held by a civilian, so it’s difficult for someone in an elected position to grasp the responsibilities — civil and moral — that soldiers face. I drink a Corona every Memorial Day, not because I like Corona, but because Corona was Kyle’s favorite beer. Sometimes I’ll leave one open as a tribute. When people ask why and find out I’m a veteran, they don’t pause to reflect on his memory or the fallen — they thank me for my service. It’s not that I don’t appreciate the sentiment, it’s just the wrong day to be honoring those of us who came home alive. 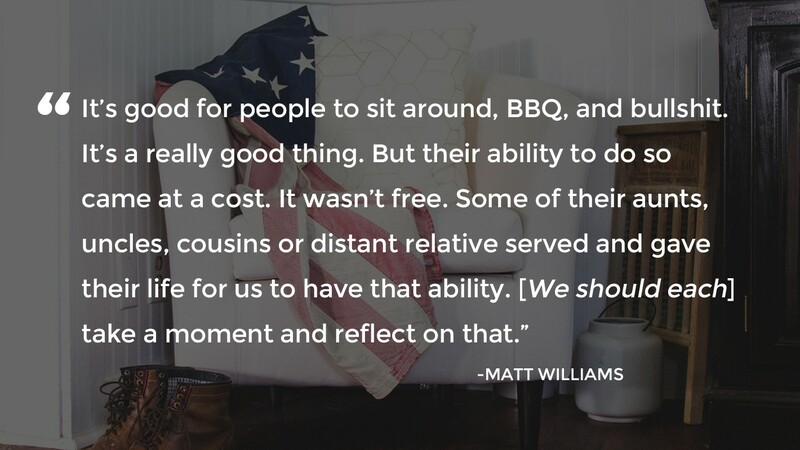 Part of the disconnect soldiers have when returning home is they spent time in an environment of selflessness only to come home to a world obsessed with selfishness and consumerism. We share our cots, our stories, our food, our water, our ammo, and sometimes our personal safety and lives with one another. So when our friends die, and the person in front of us freaks out at the barista who got their mocha order wrong, we disengage with the world. We become angry. We kill ourselves. * We believe only veterans understand us. 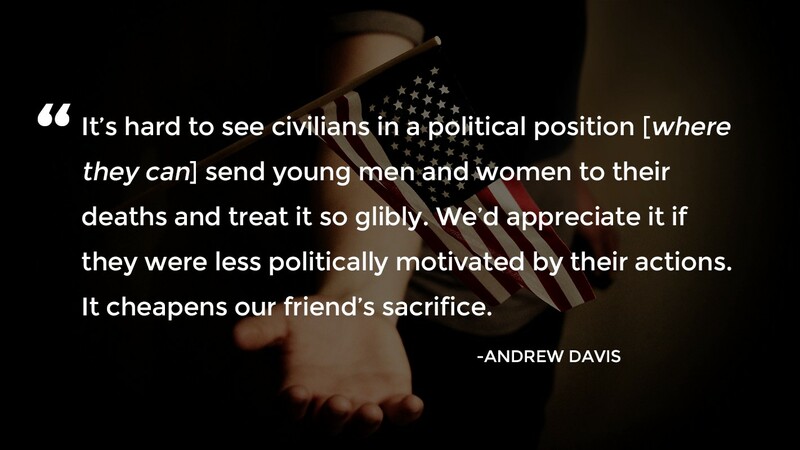 The world around us becomes a reminder that the populace at large doesn’t understand, let alone care, what Memorial Day is for, and we’re left carrying the weight of our friend’s death alone. What people don’t realize is that those of us who’ve lost a friend have a piece of us missing. Somewhere in a desert, jungle, beach, or mountain, the part of our soul knitted to our brothers and sisters forever remains. If it were as simple as returning to the area where we fought to retrieve our missing piece, we would. 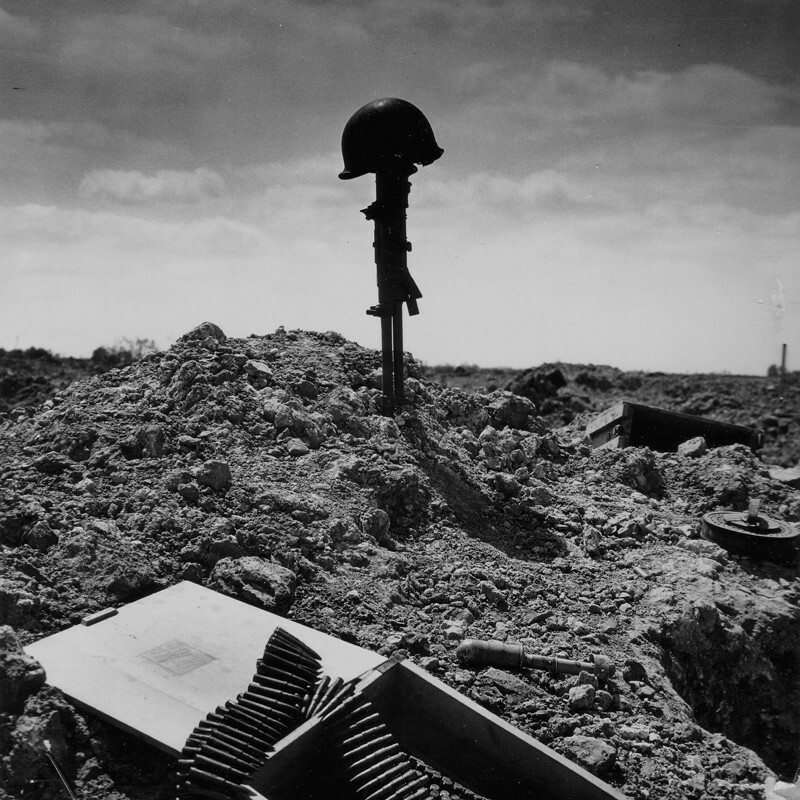 But the blood ties that connected us have long since dried into the dust where it was spilled, and each Memorial Day our heart remembers what it lacks. All we ask is that you remember them too. 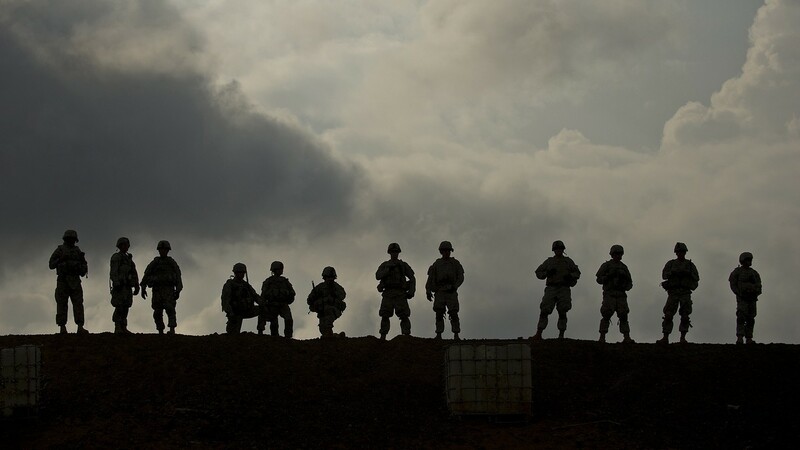 A reported 22 veterans commit suicide every day. To learn more or to take action, visit Mission 22. This story was funded by the contributions of Medium members. Become a member today.